Become a Coordinator - Farmers and Hunters Feeding the Hungry - Hunt Down Hunger! 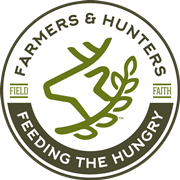 We’re excited that you are interested in the ministry of Farmers and Hunters Feeding the Hungry! FHFH helps hunters return to their heritage as food providers by turning venison and other big game—God-given renewable resources—into nutritious meat for the hungry among us. FHFH is now serving the hungry in many states across the nation. While coordinating FHFH locally does take some work, the rewards are well worth the effort. The following link will provide you with a document that explains how FHFH can help you begin this new ministry for your community: The FHFH Advantage. If you are ready to apply for an FHFH Local Coordinator position please download, print and complete the following items and return them for consideration to: FHFH, P.O. Box 323, Williamsport, MD 21795. Call us at 301-739-3000 or email us at staff@fhfh.org if you have any questions! (Please note—three reference forms should be completed and returned directly to FHFH by the individuals you distribute them to). FHFH offers a wonderful opportunity for the hunting community to make a positive impact in the lives of those in need. Trust me … becoming a part of the FHFH ministry will change your life as well—just like it has for me and the rest of the FHFH family!